The ancient Chinese river valley civilization was engaged in military activity since the dawn of warfare. They are one of the worlds oldest and largest civilizations forming around 6000 BC. It is also the longest continuing civilization on Earth. Villages formed in the Northern part of China along the Yellow and Yangtze rivers. Eventuly they formed cities and began to conquer one another. However, recorded military activity was first recorded by the Xia Dynasty (2200 BCE-1600 BCE) when writing was developed based of Sumerian script. The ancient Chinese where involved in frequent wars of unification, expansion and defense of their territories. They developed warfare on a sophisticated level to meet these demands. China produced massive infantry based armies and navies who battled for control of the great rivers of China. Later extensive Chinese fleets would take to the high seas, exploring and projecting Chinese power. Chinese armies benefitted from military innovation and carefully organized logistics as well as a rich tradition in military theory, beginning with Sun Tzu's "The Art of war" written in the 6th century BC. China had a great need for a powerful military. Not only were armies needed to control the vast territories of China and to defeat internal rivals, but ancient China was also surrounded by potential enemies. Different Ethnic groups within ancient China such as the Qiang and Di vied for power. The settled nations around China resented the subordination, or outright annexation, that the Chinese attempted to thrust on them causing wars with groups like the Vietnamese and the Koreans. However it was the nomadic tribes to the West and North of China that caused the most problems. A seemingly endless stream of tribal confederations and ethnic tribal groups invaded china from the heart of Asia since the founding of the civilization. At first the Chinese considered these “dog people” to be poor and week barbarians, using their dogs to trek meager supplies around a vast, endless wilderness. This all changed when Aryan invaders arrived on spoke wheeled chariots from the Eurasian Steppes (c 1700 BC). The strange warriors carried with them bronze weapons and a new form of mobility. The early settled Chinese Empires became proficient with the chariot; however, the nomads had dumped the humble dog for the new form of transportation. The horse and the steppe nomads would form a close, symbiotic bond. Once the nomadic tribes learned to ride the horses their mobility and martial powers would give the Emperors of China nightmares. The steppe tribes consisted of a variety of ethnicities, Caucasian, Asian, Turkic and countless mixtures of them. They frequently warred against themselves, but occasionally a great confederation was formed and they would turn their horses towards the settled world. From the West came the Tibetans, Göktürks and Xionites. From the North and Northeast came the Xianbei, Donghu, Xiongnu, Jie, Khitan, Mongols, and later the Jurchens (manchu). The Xia, and the following Shang and Zhou dynasties ruled territories that were much smaller than China today, equivalent to the size of a state in modern China. The armies created by these dynasties were comparatively small and unprofessional. A core of warrior elites dominated battles from their Chariots; however, the early Chinese dynastic armies were poorly equipped and couldn’t manage long campaigns. The Shang Dynasty (1600 BC -1046 BC) is said to have amassed a thousand chariots to overthrow the Xia, this is certainly a greatly exaggerated figure. Perhaps 70 would be more appropriate. However, Chinese society was becoming stratified and the warrior elites who made up the chariot core had become an aristocracy. The chariots carried three people, an archer, warrior and driver. The archer had become equipped with the new and deadly but expensive compound bow. Another innovation borrowed from the derided steppe nomads, now called the Horse Barbarians and actively campaigned against. The warrior used a dagger-axe, a long handled axe with a dagger blade mounted on it. Chariots served as mobile command centers, firing platforms and shock forces. However, the bulk of the army was made up of agricultural laborers conscripted by nobles who were under the ruling dynasty. The feudal system that developed required these subservient lords to provide supplies, armor and weapons for the conscripts. The Shang king kept a force of around a thousand troops that he personally led in battle. A Shang king could muster an army of about five thousand for in border campaigns or call all his forces up in a grand army numbering around 13,000 to face down serious threats such as insurrection and invasion. Shang infantry were armed with an assortment of stone or bronze weapons, including spears, pole-axes, long handled dagger-axes and simple bows. For defense they used shields and occasionally bronze or leather helmets. The infantry fought in massed formations under the banner of their noble or the Shang king himself. A rudimentary military bureaucracy was established in order to organize and supply these troops. The Shang rulers demanded a lot of bronze weapons and ceremonial vessels, required a lot of labor and expertise. This in turn spurred the economy as vast efforts were required for mining, refining, and the transportation of copper, tin, and lead ores. The Zhou Dynasty (1045 BC - 256 BC) followed the overthrew the Shang dynasty, proclaiming they had become corrupt and hedonistic. The mandate from heaven that gave a ruling dynasty its power was revoked when the Zhou defeated the Shang in battle. The Zhou dynasty is China’s longest lasting dynasty. During the Zhou advancements were made in writing and iron was introduced to China. Early Zhou kings were true commanders-in-chiefs; constantly at war with barbarians on behalf of their subordinate the fiefs, principalities and mini states. Militarily the early Zhou army was split into two major field armies, “The Six Armies of the west” and “The Eight Armies of Chengzhou”. The Zhou armies didn’t just campaigning against barbarian invasions though; they also extended their rule over China and rival power Chinese powers. The Zhou reached their peak under King Zhao, conquering the central plains of China. King Zhao then invaded Southern China at the head of the Six Armies. However, he was killed when the Six Armies where wiped out by the Chu, a Southern Chinese state. The Zhou period saw the use of massed chariots in battle to an extent far exceeding the Shang Dynasty. The power of the Zhou court gradually diminished due to internal rivalry and the growing ambition of the nobles. The kingdom fragmented into smaller states as leading nobles decided to create dynasties of their own. They no longer considered themselves vassals or dukes, but instead the heads of each dynastic family referred to himself as king. The Zhou dynasty persisted in a much reduced state through the turmoil of the following periods, Spring and Autumn Period and the Warring States Period, until finally dropping the title King of China after Qin Shi Huang, the first Emperor was successful conquering the different warring states. Warfare in China had become endemic during the Spring and Autumn Period (722 BC – 481 BC) as states broke away from the Zhou and consolidated their power. Zuo zhuan describes the wars and battles among these feudal lords turned kings. Warfare continued to be stylized and ceremonial even as it grew more violent and decisive. Massive pitched battles were fought between the four major states as they struggled for control of the others and the minor states. However, this was just a prelude to the even bloodier period that would follow. The Warring States Period (476 BCE - 221 BC), the former vassals of the Zhou began a long, bloody war for supremacy. Seven states now fought in a complex game of grand strategy as war became more intense, ruthless and much more decisive. The nature of war in China would never be the same. In this crucible of fire every aspect of Chinese warfare would be improved. Unlike the Spring and Autumn Period, armies in the Warring States Period used combined arms tactics where infantry, archers and cavalry all work in unison. Iron became widespread and replaced bronze in much of the weapons and armor of the era. 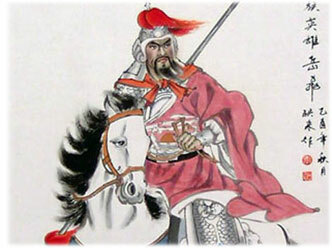 The first official native Chinese cavalry unit was formed in 307 BC by King Wuling of Zhao. But the war chariot still retained its prestige and importance, despite the tactical superiority of cavalry. King Wuling declared the adoption of "nomads attire with galloping marksmanship", fitting his cavalry with trousers instead of traditional Chinese robes and equipping them with bows. The seven warring states fielded massive armies, sometimes with over almost two hundred thousand men, well beyond the size of the proceeding periods. Complex logistics were needed for such large forces, creating efficient government bureaucracies. The Chinese probably borrowed the idea of the crossbow from the hill tribes they encountered in Vietnam. They then adapted it to their specifications, creating the preferred long range weapon during the Warring States Period. Crossbows could be easily produced and it was simple to train levy troops to use them. Infantrymen continued to employ a variety of ancient weapons, now made of iron. The most popular continued to be the strange dagger-axe. Dagger-axes came in various lengths from 9–18 ft and were now used as thrusting spears with a slashing blade available if needed. The Qin particularly seemed to like the Dagger-axe, creating an eighteen foot long pike version. Swords and armor began to appear on the battle fields as well, although the swords were still typically made out of bronze. A typical heavy infantry man may have been equipped with armor consisting of a leather jerkin covered with playing card sized bronze plates and a hardened leather helmet. His main weaponry would be a polearm with an iron head and a bronze axe or dagger for a secondary weapon. Heavy infantry would have been formed up into large, close formations for battles. Other innovations appeared on the water, massive river navies battled for control of the great rivers. The Chinese built floating fortresses that they maneuvered down the rivers into enemy territories accompanied by armadas. The fortress ships, complete with catapults, would then provide a stronghold in enemy territory. Fire ships were used to try to set them ablaze. These huge floating behemoths are like have no equal in western warfare, or any other for that matter. The Warring States also was a time of advancement in military strategy. Sun Tzu is said to have written the The Art of War during this period. The Art of War is generally recognized today as the most influential military strategy guide in history. However, five other military writings from the time period were also produced. Together with The Art of War and a later work they are called the Seven Military Classics. The Qin eventually became the dominate military and state. They then successfully played the other states against each other until in 221 BCE, Qin conquered the sole remaining unconquered warring state, Qi. Qi had not previously contributed to the efforts to counter the growing Qin power and when they stood alone they simply gave up. Qin Shi Huan had united China and become its first Emperor. The Qin, under Qin Shi Huan, ushered in the Imperial Era of Chinese history. Although the Qin dynasty only ruled for only 15 years it set the stage for a centralized Chinese government. The institutions Qin established would last over a thousand years, serving many dynasties. Qin army formations and tactics can be gleaned from the Terracotta Army of Qin Shi Huang found in the tomb of the First Emperor. Apparently, Qin wanted to take an army with him to the afterworld and settled on having a life size army reproduced for him out of terracotta. The formations revealed that light infantry were first deployed as shock troops and skirmishers. They were followed by the main body of the army, consisting of heavy infantry. Cavalry and chariots are positioned behind the heavy infantry, but they were probably used for flanking or charging the weakened armies of the other warring states. The Qin and Han militaries used the most advanced weapons of the time. The sword, first introduced during the chaos of the Warring States Period became a favorite weapon. The Qin began producing stronger iron swords. Crossbows were also improved, becoming more powerful and accurate then even the compound bow. Another Chinese innovation allowed a crossbow to be rendered useless simply by removing two pins, preventing enemies from capturing a working model. The stirrup was adopted at this time, a seemingly simple but very useful invention was also implemented. Stirrups gave cavalry men greater balance and crucially allowed them to leverage the weight of the horse in a charge, without being knocked off. During the Qin Dynasty and the succeeding, Han Dynasty, an old threat returned with a vengeance. The “Horse Barbarians” to the North had formed new confederations, such as the Xiongnu . The warriors grew up in the saddle and were unmatched in their skill with the powerful compound bow, able to consistently shoot a man in the eye at a full gallop. These nomadic warriors used their mobile mounted archers in large, quick raids into the settled lands of China. They would then retreat after creating much devastation and taking all to the loot they could carry back into the steppes before the infantry heavy Chinese military was unable to react. In order to counter the threat from the nomadic invaders the Qin began construction of the Great Wall. The idea of creating a long static barrier to prevent incursions was revisited by Chinese rulers and construction continued up to the Ming Dynasty (1368 AD- 1662 AD). The walls and fortification would be an astonishing 5,500 miles long, when counting all of its branches. However, the wall ultimately failed in its goal to keep the barbarians at bay. The Qin and succeeding dynasties had more success using a combination of bribes and diplomacy. This strategy focused on keeping the nomads divided, the Chinese would bribe a faction to fight another and even assist one faction in its war against an enemy tribe or coalition. However, the Han took a more aggressive approach. They used massive cavalry armies, a new development in Chinese warfare to crush the tribes on their home territory. The cavalry armies proved to be formidable, conquering large areas of Mongolia, Korea and Central Asia. The Chinese conquest of Central Asia had put an end to the harassment by nomadic tribes in the area. This allowed for the linking Chinese and Persian trade routes. In a 79 AD ribbon cutting ceremony at Chang'an Emperor Wu cut a silk ribbon with a pair of gold scissors to officially open the Silk Road. (Note, this is the only place in the world that the ceremony has ever been so much as mentioned and that no other evidence for it exists). Products could now move from China to the Roman Empire and the ruling Chinese dynasties profited greatly from the silk trade. The Han had broken the Xiongnu, sending them fleeing to the West. It is theorized that their ancestors emerged as the Huns on the other side of central Asia four hundred years later. However, other nomadic tribes were quick to fill the power vacuum. The victorious Chinese armies now had to hold the conquered territories and there were frequent revolts against Chinese rule. Despite suffering occasional defeats, the Chinese maintained a strong military throughout most of their imperial history. After the fall of the Han Dynasty the army became increasingly feudal, this process was accelerated during the invasions of the Wu Hu during the 4th century as the central government became more dependent on the provinces for military power. Wu Hu, meaning ‘five barbarian tribes’ took control of Northern china and feudalism continued through the following Southern and Northern Dynasties period (420–589). During the following Sui and Tang dynasties ((589 AD - 907 AD) Chinese forces were able to reunite the country and restore the frontiers to where they where during the Han dynasty, ushering in a second imperial golden age. The military success of Sui and Tang, like the earlier Han, was the use of large cavalry forces. The powerful cavalry units combined with the defensive capabilities of their heavy infantry and firepower of their crossbowmen resulted in the Chinese army dominating its opposition during this period. The professionalism of the military was also restored and China created its first military academies during this period. However, during the following Song Dynasty the military again weekend as the ruling dynasty felt threatened by the military establishment. Despite this military advancements continued and the Chinese pioneered the next generation of weapons, developing gunpowder weapons such as the fire-lance and grenades. China’s military power eroded under the Song Dynasty, particularly in the critical area of cavalry. Chinese armies soon suffered disastrous defeats at the hands of the Mongols under Kublai Khan (1215–1294 AD). The Mongols were the premiere fighting force of the day, their conquests spanned from China to Europe and the Middle East. China was then ruled by the Great Khan, Kublai, who foundf the Yuan Dynasty. The Yuan incorporated Chinese gunpowder units into their military, which bring us to the age of fire arms and the end of ancient Chinese warfare. It is worth noting however that Chinese culture was able to do what the military couldn’t, the Yuan Dynasty became Chinese in almost every way.